Garden Safari without the Elephants! Over the weekend of 14th/15th June 2008, Shoreham Village held a Garden Safari, where villagers opened up their pretty and well presented gardens to the general public to help raise funds for the Village Church. 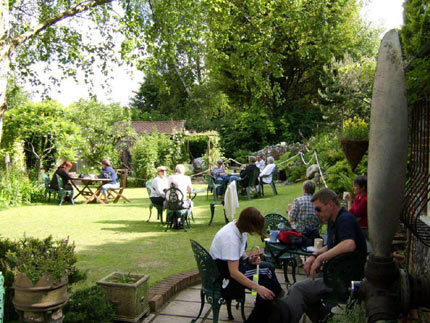 The Museum and Teagarden joined in with the ‘safari’ and experienced one of its busiest weekends on record with a constant stream of delighted visitors, most of whom quenched their thirsts and were tempted by the great range of cakes! Many safari visitors who took time to look around the Museum were very praiseworthy about the interesting and well presented exhibits. 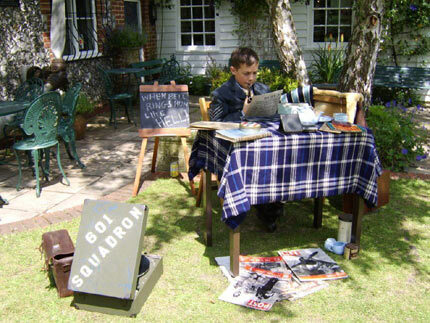 The generally dry, warm and sunny weather enabled many visitors to partake of their tea and cake in the teagarden where they found a young RAF Sergeant Pilot Callum at ‘Readiness’ – well, ready for his next tea and a ‘wad’ [cake]. Mind you after a number of ‘Scrambles’ [to the loo] throughout the day, it all became too much and he eventually stood down for forty winks! The participation of the Museum in the Garden Safari proved to be very enjoyable and made for a great start to the summer ahead. You are currently browsing the Shoreham Aircraft Museum – News archives for June, 2008.